The Church attaches great importance to the feasts of the Apostles, which are preceded by a Vigil (Collect). 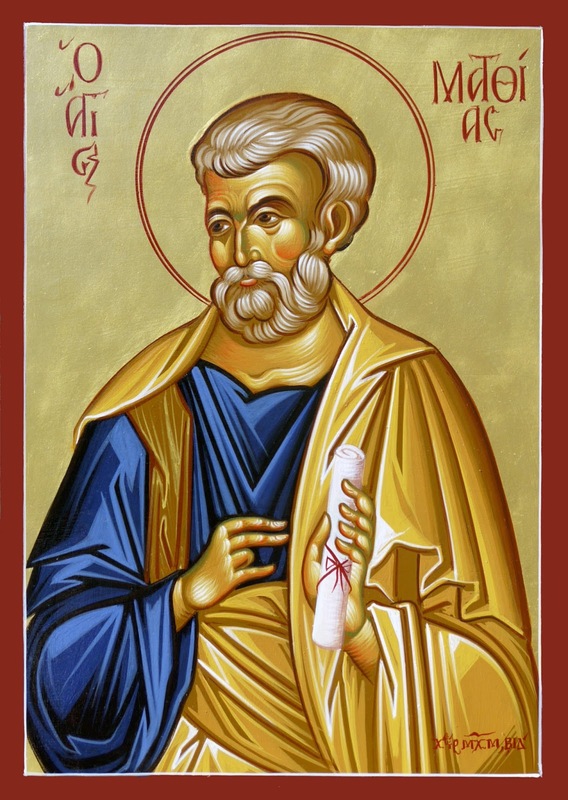 Saint Matthias, elected by the will of God (Gospel) received Judas’ share in the inheritance of the Church which was figured by the Promised Land divided into twelve tribes (Epistle). The Church applies to the apostles that which, the author of the Book of Ecclesiasticus said of Isaac, Jacob, Moses and Aaron. Called “to give his life” (Gospel), like Jesus, to crown his apostolic career, he suffered martyrdom and was “clothed by God in resplendent glory” (Communion). Let us ask God to prepare us to celebrate piously the feast of His Apostle, St. Matthias. Grant, we beseech thee, Almighty God, that the worshipful Feast of thy blessed Apostle Matthias on the eve whereof we now stand, may avail us to the increase both of godliness toward thee, and of health to our own souls. Through Jesus Christ our Lord, Who liveth and reigneth with Thee in the unity of the Holy Ghost, one God Forever and ever. R.Amen. Lesson from the Book of Wisdom. The blessing of the Lord was upon the head of the just man. Therefore the Lord gave him an inheritance and divided him his portion in twelve tribes; and he found grace in the eyes of all flesh. He magnified him in the fear of his enemies, and with his words he made prodigies to cease. He glorified him in the sight of kings, and gave him commandments in the sight of his people, and showed him his glory. He sanctified him in his faith and meekness, and chose him out of all flesh. And he gave him commandments before his face, and a law of life and instruction, and he exalted him. He made an everlasting covenant with him, and girded him about with a girdle of justice: and the Lord crowned him with a crown of glory. The just man shall flourish like the palm tree : like the cedar of Libanus shall he be multiplied in the house of the Lord. V. To show forth Thy mercy in the morning, and Thy truth in the night. Thou hast crowned him with glory and honour, and hast set him over the works of Thy hands, O Lord. Offering to thee these holy mysteries with reverence for the high dignity of the Apostleship, we beseech thee, O Lord that through the prayers of blessed Matthias, thy Apostle, to whose feast we look forward, thy people ever may set forth their desires before thee and gain what they seek. Through our Lord Jesus Christ Thy Son. Who liveth and reigneth with Thee in the unity of the Holy Ghost, one God Forever and ever. R.Amen. His glory is great in Thy salvation : glory and great beauty shalt Thou lay upon him, O Lord. Be appease, we beseech thee, O Lord, by the prayers of thy holy Apostle Matthias, and grant us pardon and unfailing remedies. Through our Lord Jesus Christ, Who livest and reignest, with God the Father, in the unity of the Holy Ghost, one God For ever and ever. R. Amen.